The atlas a.k.a. C1 is the first vertebra of the spinal column. It connects with the occipital bone, which, is a flat bone located at the posterior part of the head. It contains the dens of the axis, instead of centrum or body of a typical vertebra. 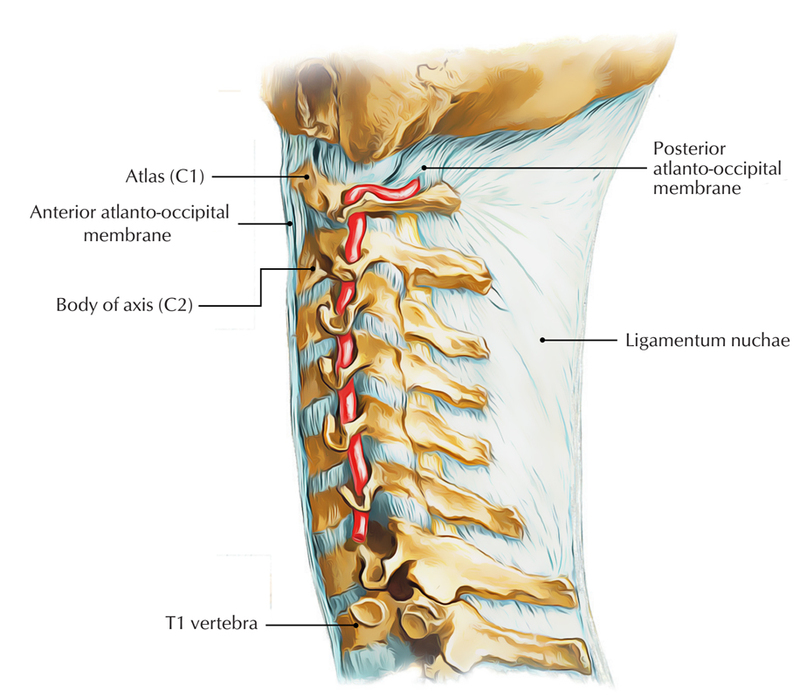 The transverse ligament attaches with the dens of the axis and separates its vertebral canal into two parts, opposite the anterior arch of the atlas. Anterior 1/3 is acquired by the dens. Posterior 2/3 is made up of the spinal cord. 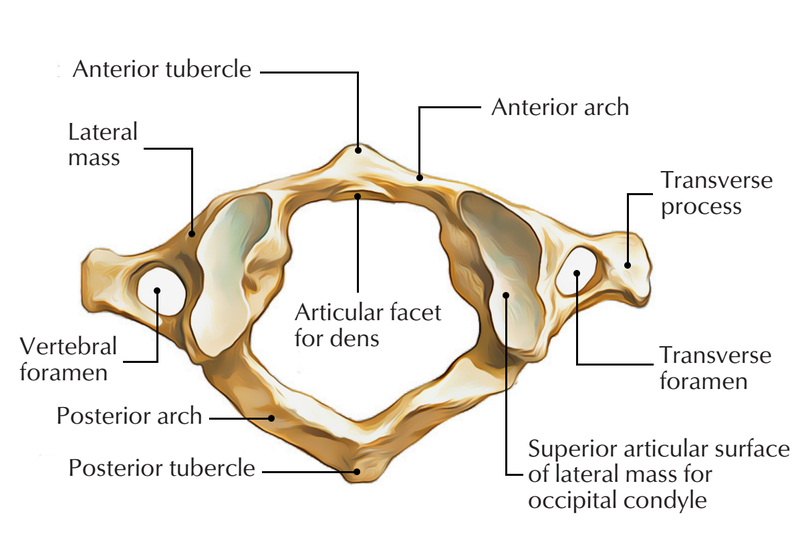 In the median plane, the anterior arch is indicated via the anterior tubercle on its anterior part and an oval facet on its posterior part to articulate together with the dens of the 2nd cervical vertebra and create atlantoaxial joint. Two-fifth of the ring created by the posterior arch and a median posterior tubercle indicates its posterior part. A groove which harbors the vertebral artery and the 1st cervical nerve indicates the upper surface of the posterior arch behind the lateral mass. Correspondingly, upper and lower surfaces create superior and inferior articular facets. Superior articular facet has concave and elongated structure. In order to join with the equivalent condyle of the occipital bone, it is pointed superiorly and medially for creation of the atlanto-occipital joint. Inferior articular facet is flat and circular. In order to create the atlantoaxial joint, it is pointed inferiorly, medially and posteriorly for articulation with the equivalent facet on the axis vertebra. A small roughened tubercle is indicates the medial surface of the lateral mass in order to attach to the transverse ligament of the atlas. From the lateral masses, the transverse processes protrude laterally. Compared to cervical vertebrae they are strong and larger. In order to rotate of the atlas vertebra the extended transverse processes function proficiently as levers. With the exception of C7, It is longer compared to all of the transverse processes of the cervical vertebrae. Costal lamella generally encloses it. Transverse foramina comprises of the vertebral arteries. On the anterior part of the transverse process anterior tubercle is occasionally found. It is a synovial joint which is surrounded by hyaline. It is located in the middle of the occipital condyle and concave side of the lateral mass of the atlas. It is covered by a synovial capsule and it is supplied by C1. This joint facilitates flexion, extension and lateral flexion. It is a synovial joint which is covered hyaline. It is located in the middle of the dens of the axis and the posterior aspect of the anterior arch of the atlas, which enables for the rotation of the head. The transverse ligament holds the dens in its place; a bursa is also found in the middle of these two. It is a synovial joint that is enclosed by hyaline. It is located in the middle of the inferior articular facet of the atlas and the superior articular facet of the axis which allows for the rotation of the head. The joint bounded by a capsule supplied via the C2 nerve. Transverse ligament is strong band which travels posterior towards the dens of the axis and keeps it in place. Each end is connected to tubercles on the anterior arch of the atlas. Atlanto-axial ligaments attach to front of the body of the axis from the lower margin of the anterior arch of the atlas. Against ventral conversion of the dens it provides tertiary reinforcement. Posterior atlanto-occipital membrane is attached towards the upper border of the posterior arch to the outer borders of foramen magnum. An opening is present for the transmission of the C1 nerve and vertebral artery at each lateral margin, which ossifies occasionally and turns into foramen. It is innervated by C1. Longus colli connects with deep grooves of the anterior side of the body of atlas. Generally, the atlas is ossified from three points. One appears in each lateral mass around the seventh week of fetal life, and spreads out backward. A slim recess filled with cartilage divides these portions of bone, posteriorly from each other at birth. They merge either directly or via the medium of a distinct center created in the cartilage in the middle of the third and fourth years. The anterior arch is made up of cartilage at birth, then, a distinct center emerges around the end of the first year after birth in this center and from the sixth to the eighth year connects the lateral masses. Via the anterior parts of the superior articular facets The lines of combination spreads outwards. The atlas/C1 and axis/C2 have specific structure in order to facilitate a greater range of motion compared to normal vertebrae. They facilitate the nodding and rotation motion of the head. The dens function as a pivot which allows the atlas and attach with the head in order to rotate on the axis, side to side.